As is usually the case during the holiday season, I got so busy yesterday with my day jobs, shuttling back and forth to the airport and celebrating my birthday that Day 6’s blog got lost in the shuffle. So welcome to Day 6 and 1/2! Day 6 1/2 – Game Night – This has long been a tradition in my family although we don’t limit it to Christmas. We starting having game night when I was just a child. 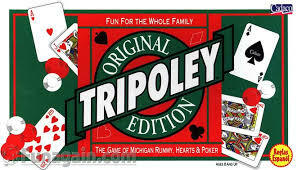 My mother bought a game called Tripoley, popped up a big batch of popcorn, and taught us to play. Game night has evolved through the years, we have had marathon nights of Risk where the last 2 players were still competing the next morning while everyone else had fallen asleep. We have tried quite a few new games and added a few to the regular mix. 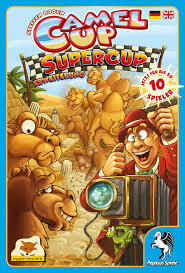 Two of our current favorites are Telestrations and Camel Up Supercup. 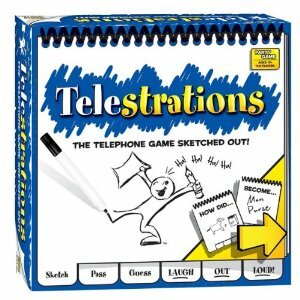 Telestrations had us laughing so hard we had tears in our eyes. Game night is a great way to de-tress, stop focusing on the things that need to be done during the holidays and reconnect with loved ones. Enjoy those fresh-baked Christmas cookies from The Twelve Days of Christmas – Day 3 while engaging in some friendly competition. Be ready to laugh, tease and create some great memories. We are always open to new ideas, what board games do you recommend? This entry was posted in Cheers!, Family Fun and tagged Christmas, Family, Friends, Holidays, Humor, Lifestyle, positive, Season on December 18, 2015 by notsooldladies.